The MLA, like other academic associations, wants to be covered by the national media, but it generally gets very little press coverage for its achievements, which are of little interest to most people outside of the association. Inside Higher Ed and the Chronicle of Education report on the highlights of the annual MLA convention in summary fashion, but the meeting does not tend to generate big news. As much as the MLA leadership wants good press, it does not relish the media attention associated with controversy, particularly controversy having to do with the academic boycott of Israel. Rosemary Feal, the outgoing Executive Director of the MLA, did not want to deal with the issue of academic boycott, which divided the association. Had the boycott resolution passed, Feal and her staff in their posh New York offices would have had to contend with a deluge of virtual assaults from supporters of Israel, as was the case in 2014 when the Delegate Assembly voted in favor of the rather mild Resolution 2014-1: “the MLA urges the U.S. Department of State to contest Israel’s arbitrary denials of entry to Gaza and the West Bank by U. S. academics who have been invited to teach, confer, or do research at Palestinian universities” (See DA Minutes for debate of resolution 2014-1). No doubt Feal and other MLA employees were relieved that the academic boycott resolution was voted down at the 2017 Convention. In regards to the MLA decision, the fight was conducted within the Association itself, led by Prof. Neslon from the University of Illinois, and Prof. Berman from Stanford University. They were assisted by various Jewish organizations, along with The Committee of University Heads in Israel. Below is the statement that Jasbir Puar, Associate Professor of Women’s & Gender Studies at Rutgers, wrote protesting the MLA Delegate Assembly vote against academic boycott. Puar donated her MLA Crompton-Noll award money t o the Palestinian Academic and Cultural Boycott of Israel (PACBI) in light of the despicable outcomes of the Delegate Assembly meeting on January 7, 2017. Karen Jaime read the statement at the MLA award gathering for the GL/Q Caucus. Puar is the author of Terrorist Assemblages: Homonationalism in Queer Times (Duke University Press 2007), which won the 2007 Cultural Studies Book Award from the Association for Asian American Studies. Puar’s edited volumes include “Queer Tourism: Geographies of Globalization” (GLQ: A Journal of Lesbian and Gay Studies); and co­edited volumes “Sexuality and Space” (Society and Space), “Interspecies” (Social Text), and “Viral” (Women’s Studies Quarterly). At the annual convention of the Delegate Assembly of the Modern Language Association [MLA], a resolution to endorse the Palestinian call for a boycott of Israeli academic institutions for their involvement in violations of international law was voted down by 113-78. The Delegate Assembly is the representative body of the Association, and the resolution will not now move forward for consideration by the full membership, comprised of over 25,00 scholars and teachers. The MLA Delegate Assembly’s vote differs from that of a growing number of academic associations that have previously endorsed the boycott for Palestinian freedom, justice and equality. In recent years over twelve associations and faculty unions have voted to endorse an academic boycott of Israeli institutions including the American Studies Association, Native and Indigenous Studies Association, the Association for Asian American Studies, and the National Women’s Studies Association. Unlike the boycott of South African academia during the divestment campaigns of the 1980s, which targeted all South African scholars, the Palestinian boycott exempts individual scholars and focuses on Israeli universities as institutions that have a documented track record of complicity in the Israeli government’s soon-to-be 50 years of occupation. 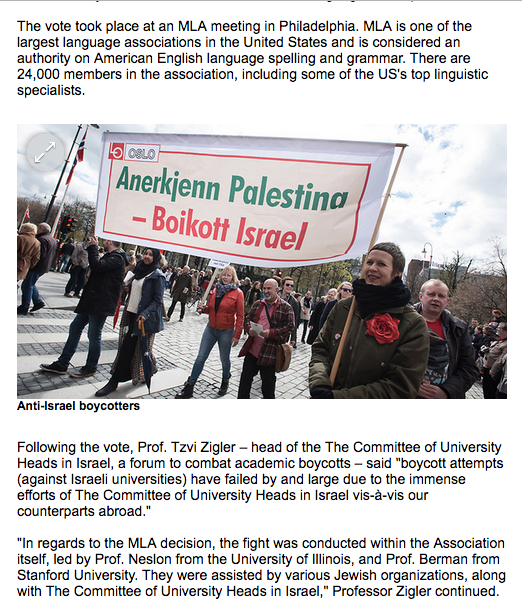 Endorsing an academic boycott resolution does not prevent Israeli scholars from teaching, researching, traveling or attending conferences such as the MLA Convention. “Palestinian scholars and students suffer under daily restrictions on their right to education, from campus closures and detainment without charge to denial of visas to travel and restrictions on the import of books and materials. These restrictions affect them as individuals and institutionally,” says Salah Hassan, a professor of English at Michigan State University. The resolution had been in front of the MLA for over two years, having originally been submitted, along with an opposing resolution, in October 2014, for consideration at the January 2015 Convention. It was then agreed to suspend both resolutions to allow the Association’s membership to hear a full debate on the topic of academic boycott. Since then there have been three Town Hall sessions, several panels on the issue, and an unprecedented number of panels dealing with Palestinian literature and culture that have done much to advance understanding of the conditions of Palestinians in Palestine and globally. A counter resolution against boycotting Israeli institutions passed by a narrow margin of eight votes. The resolution must now receive 10 percent of the MLA membership vote this Spring in order to pass. Noting the context of intimidation and retaliation that has dogged advocates of BDS, Cynthia Franklin, professor at the University of Hawai’I, noted that passage of the anti-boycott resolution “provides support for groups like Canary Mission and legislation criminalizing boycott.” Canary Mission is an anonymous website that posts personal information on professors or students who advocate for BDS. 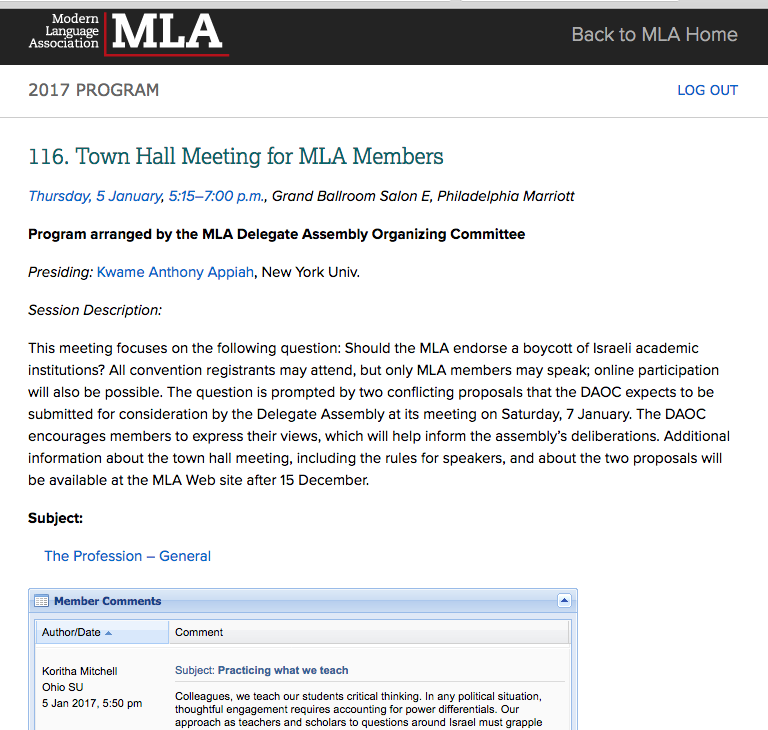 On Thursday January 5, approximately 200 people attended the MLA Town Hall Meeting on academic boycott that was convened by the MLA and chaired by the current President Anthony Appiah. The Town Hall Meeting was the first of a two of sessions that focused on the Delegate Assembly vote on a resolution to endorse the boycott of Israeli academic institutions. The actual debate and vote on the resolutions will begin on Saturday January 7, in the early afternoon between 12:00-1:00 and is likely to last most of the afternoon. If you are attending the MLA, come to the Delegate Assembly meeting in Grand Ballroom Salon G-H of the Marriott Philadelphia and speak out in favor of the boycott resolution. The political-economic agenda of the neoliberal university, and the intentional decisions that advance it, has led to a dependence on cheap, precarious labour. But the roots of such academic labor are analogous to, rather than distinct from, Palestine solidarity and the BDS movement, contrary to many anti-boycott arguments. Graduate and adjunct instructors working in the university today are increasingly building this solidarity on the shared grounds of the racialized history of contingent labor in the U.S. and the colonization of Palestine by Israel. Nick Mitchell, at UC Santa Cruz, has uncovered the modern historical logics of universities’ reliance on precarious academic workers – a history that he argues is in fact quite racialised. For Mitchell, the roots of precarious academic labour lie in the university’s experimentation with university labour in the late 1960s and early 1970s. With increases in minority youth attending college, demands on the university were made for an expansion of the “epistemological foundations of the university. Or the contents of what was considered valid knowledge.”[i] With rising demands for black studies, women’s studies and ethnic studies, university administrations aimed to get them without paying for them, “by instituting experimental colleges in which students taught their own classes.” The point Mitchell is making is that the precariat – adjunctification in the university today – cannot be understood without appreciating the political-economic conditions and decisions made at the time of its inception. And those decisions were distinctly racialised. This is one historical context that the BDS movement at universities today maps onto. Put differently, a line can be drawn from the racialised conditions in which the precarious adjunct was established within the existing political economy of the university, to the taking up of BDS by more and more precarious academic workers. Graduate student unions are increasingly making the connections between precarity, race and Palestine. In 2015, a protracted labour dispute between the University of Toronto and its graduate student workers and contract faculty resulted in a four-week long strike by CUPE 3902, ending in a decision to enter binding arbitration with the employer – one that certainly polarised the politically diverse union membership. Days after that decision, more than 90% of the members in attendance at the union’s annual general meeting voted to endorse BDS, and steps the union should take to explicitly advance the movement on campus. In that moment of heightened political-economic awareness among academic workers concerned with their long-term precarity, solidarity with Palestinians and their BDS movement was deemed necessary and ultimately linked with other, ostensibly discrete union battles. Indeed, there are still particular kinds of economic pressure on precarious academic workers that must be acknowledged as obstacles to making those connections publicly. PhD graduates are experiencing a rough academic job market. It appears to be a market flooded with strong talent, where the slightest edge may mean stable employment, and a small slip up or second guess from the employer may mean another year of income uncertainty. The concern is that activism practiced by prospective job candidates is just too controversial and disruptive for campus life, indeed “too political;” this consciousness and discourse of course occludes the reality that almost all scholarship is made political by several factors, including what we choose to investigate, what we omit, the methodologies we deploy, and the conditions in which that knowledge is produced. Academic associations too are increasingly wading into the BDS debate. Juliana Hu Pegues has recently analysed the language of three separate BDS resolutions passed by respective academic associations – American Studies Association (ASA), Association for Asian American Studies (AAAS), and Native American and Indigenous Studies Association (NAISA). 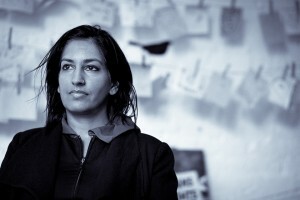 While commending all three for their stances and for their attempts to critique the reinforcing structures of imperialism, racial oppression and settler colonialism, she suggests that the language of each resolution could go further in addressing how these intersections in turn can and must create “capacious” understandings of solidarity and resistance. [ii] She notes, for example, how the AAAS missed an opportunity to highlight how Asian migrant labour was used to facilitate “Native land dispossession” while building hegemonic liberal histories of American citizenship. In March 2016, the National Conference for Black Political Scientists passed a powerful resolution boycotting Israeli academic institutions. The Whereas clauses include explicit references to the “negatively impacted working conditions of Palestinian scholars” because of the occupation; and the US “funding of Israeli militarism”, namely how it is “robbing Black communities of desperately needed reparations” and has “hamstrung the Palestinian economy causing premature deaths and astronomical incarceration rates”. [iii] The intersections of political economy and race are clearly on display in the resolution, including by citing recent Black Palestine solidarity efforts, specifically the high-profile campaign “When I see them I see us.” This is further example that enmeshed political geographies are increasingly being understood as such, what scholars of social justice across disciplines have been calling for. The support from these various university interest groups suggests that BDS is shifting consciousness. This is because of the critical work that has been done and continues to be done by the founders and early adopters of the tactics and strategies of BDS – notably often women of colour – their educational activities highlighting, for example, the logics and mechanisms of Israeli settler colonialism and apartheid. Many of the tactics being used against BDS today – disrupting campus events discussing BDS, and the attempted discrediting and smear attacks on supporters through vicious claims of anti-Semitism – suggest that the opposition is finding it increasingly difficult to win on the merits of their arguments, which are indeed quite weak. But the backlash is still very real, if ever more desperate. For example, Canary Mission is a website dedicated to outing students who support BDS, in an attempt to malign their reputations in order to jeopardise their professional prospects. The website is a fascinating expose in the kinds of flacid arguments made against BDS, and also of how more prominent and less precarious BDS backers are absent from the site. It suggests that these opponents are particularly aware of, and seek to exploit, precarity. These shady campaigns are sometimes joined by the exceptional resistance university administrations and academic staff practice against BDS on campuses. But censorship oftentimes is not so overt, and stems from forms of self-censorship that we as precarious academic workers sometimes practice. Contract faculty often must limit their BDS work to behind the scenes organizing. And tenured faculty, instead, take the more public lead and “take the heat” to protect the more precarious. 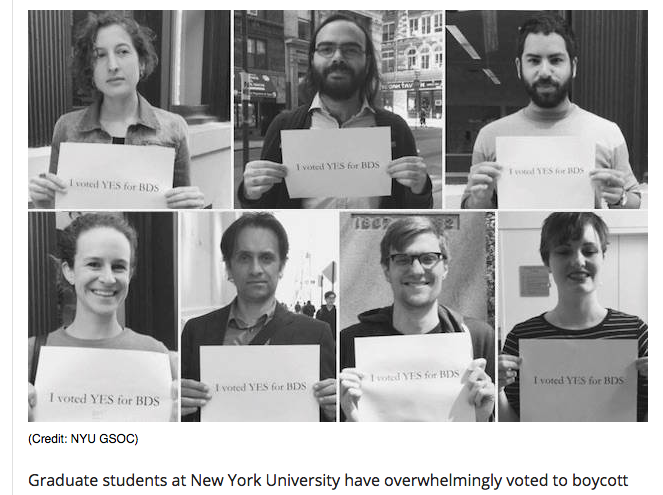 These lived experiences and realities – the increased support for BDS based on its convincing arguments; the stubborn threats against those who work to advance the movement; and the sometimes uncomfortable position precarious academic workers find themselves in vis-a-vis BDS – raise challenging questions about the praxis of politics in the academy. Ultimately the percolating up of political interventions by concerned members in various institutions, from labour unions to academic associations, is having an important positive effect. For one, it has implicitly and explicitly attacked the underpinning of prospective political backlash against precarious academic workers: fear. Through scholarly, informed, and deeply rigorous analyses of history and its contemporary relevance to persistent injustices, those in academia who have endorsed the BDS movement are creating protected spaces for young scholars who are honestly grappling with their precarity and their ethical responsibilities to the region they study. There is no hard and fast rule for how these spaces are to be created; it depends in part on the site conditions. But there is certainly an informed and serious solidarity that is being practiced. A solidarity that rightly embraces the troubling of spatial boundaries, and one that is viscerally and appropriately offended by the circulation and organised logisitics of injustices between home and abroad. Rather than label this as ivory tower moralizing, it would be more accurate – indeed more scholarly – for us to consider more critically how and why the constructed political status quo has come to be, and how the increasingly successful and more inspiring solidaristic response can be further shored up. [i] Nick Mitchell, “Theses on Adjunctification (for #NAWD),” Low End Theory (Tumblr), 26 February 2015, http://www.lowendtheory.org/post/112138864200/theses-on-adjunctification. [ii] Juliana Hu Pegues, “Empire, Race, and Settler Colonialism: BDS and Contingent Solidarities,” Theory and Event 19, no. 4 (2016). [iii] Resolution on Boycott of Israeli Academic Institutions, National Conference of Black Political Scientists (NCOBPS), Adopted 18 March 2016, http://www.ncobps.org/events/EventDetails.aspx?id=840291&hhSearchTerms=%22bds%22. Anton Shammas, a Palestinian writer and translator of Arabic, Hebrew and English, is Professor of Comparative Literature and Near Eastern Studies at the University of Michigan, Ann Arbor. We are constantly baffled by voices who keep telling us that the state of affairs in Palestine-Israel is far too complex, far too grey in order for us to take a clear, black-and-white stand in boycotting Israeli academic institutions. With the exception of some individual Israeli academics, whom we should celebrate, Israeli academic institutions, with no exception, should be boycott for being an acquiescing, unanimously complicit part in the almost 50-year old atrocious, murderous, quintessentially evil and colonialist Israeli occupation of Palestinian bodies, souls, minds, lives and lands – the longest, best American-funded occupation in modern history. It’s not a case of greys but, rather, a case of clear-cut black and white: BDS-ing Israeli academic institutions, that disgracefully and shamefully have never raised a single voice against occupation, is the only nonviolent action left for us to say No to the Israeli occupation of East Jerusalem, the West Bank, the Gaza Strip, and—yes!—the Golan Heights. Israeli academics who sham innocence, and have the sheer audacity of telling us the boycott against Israeli academic institutions would primarily hurt them, are the perfect, shameful epitome of the ongoing Israeli claim that, all things considered, Israel is always and forever the ultimate victim of the occupied Palestinians. This kind of sickening logic shouldn’t be practiced by academics. Period. It’s an unequivocally moral imperative for MLA members to support this resolution: Please say Yes to Justice!